Sometimes there's nothing better than jeans and basic gray tee. Instead of wearing flats or sandals, I opted for my super comfy Jack Purcell sneakers that I recently rediscovered in my closet. This past weekend was definitely all about casual comfort. I hope everyone had a great one! Perfectly casual & yet so cool - love it! You look so comfortable. It looks like something I would wear on the weekend! Perfect spring look! Love Converse of any kind! I was just telling myself last week that I need some crisp white sneakers! So clean and easy! Love how you styled yours -- that denim shirt looks great! totally agree! nothing beats comfy t-shirt and jeans! 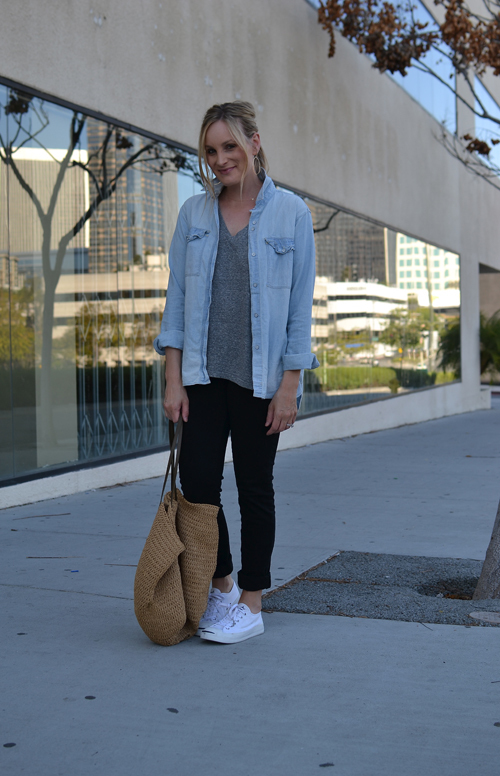 Great casual look, the sneakers are nice-I love rediscovering old loved items in my closet! you would not believe how many grey tees i own. at least 10! =) one of my fave staples! Simple and very cute. One of my favorite outfits; a simple tee with some denim and sneakers :). Very chic yet casual. Love it!